Prime Minister Sheikh Hasina on Wednesday asked Biman Bangladesh Airlines’ employees to work with utmost sincerity for brightening the image of the airlines and as well as the country, UNB reports. "I want every single person in Biman to work with utmost sincerity so that it (Biman) must not have any 'bad name'," she said. The Prime Minister said this while inaugurating the operation of newly inducted 787 Dreamliner 'Akashbeena' to Biman’s fleet at the VVIP lounge of the airport. She put emphasis on quick delivery of passenger luggage using modern technology. Sheikh Hasina also asked the officials concerned to give extra attention to security matters. "You must always give proper attention to the security matters of the airport." In the recent past, she mentioned, some countries imposed sanction on Bangladesh (cargo ban). "One country withdrew its sanction as security at our (airports) has improved," she said. Briefly describing various government efforts to improve the Biman service, the Prime Minister said the government has reached a purchase agreement with Canada to acquire another three Dash-8 Bombardier aircraft, aiming to increase domestic connectivity. She said the government is working for developing the country’s airports, too. "By the time, the Cox’s Bazar Airport runway has been expanded, while the modernisation of Sylhet airport has been completed. The work on Terminal- 3 of Shahjalal International Airport will begin soon." The Prime Minister said the work to construct a new airport in Bagerhat is on. Hasina said connectivity is very important for a country. "Keeping that in kind, the government is working hard to improve air, rail, road and waterway connectivity." She said a democratic process is continuing in the country and the country is advancing towards the path of development. "Bangladesh has earned the recognition as a role model of development in the world, we’ve to move forward further, upholding the achievement," she said. 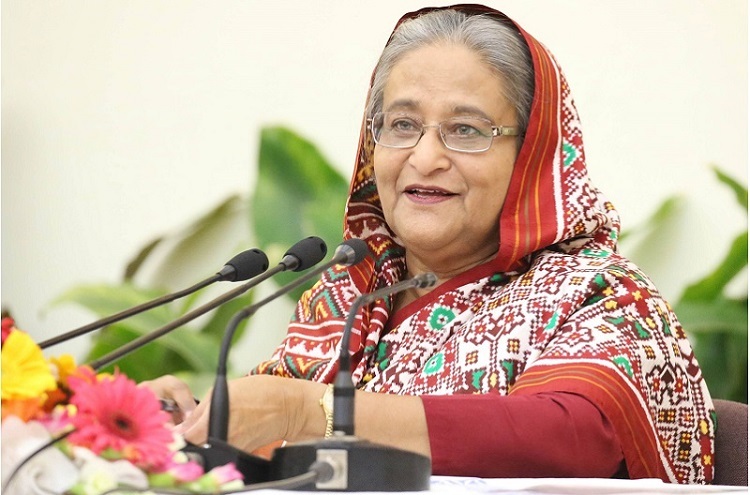 For the purpose, Hasina said, the government is implementing a five- year plan, a 10-year perspective plan while Delta Plan-2100 has also been approved to develop the country over the next one hundred years. Hasina firmly mentioned that Bangladesh is marching ahead and sought the cooperation of all in maintaining the ongoing trend of development. Civil Aviation and Tourism AKM Shajahan Kamal, Board of Directors of Biman Bangladesh Airlines Air Marshal (retd) chairman Muhammad Enamul Bari, Civil Aviation and Tourism secretary Mohibul Haque and Biman Managing Director & CEO AM Mosaddique Ahmed also spoke at the programme. Akashbeena is equipped with inflight entertainment system and onboard Wifi. Biman will allocate 10 MB free Wifi for each passenger. Passengers can buy more data, if required. The Dreamliner is a long-haul, mid-size wide-bodied, twin-engine aircraft. It has the capacity of 271 seats. The Dreamliner comes with state-of-the-art technology.